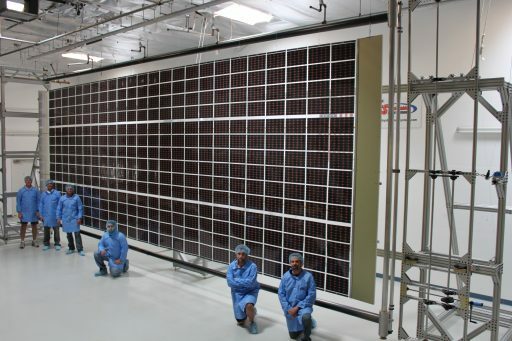 Photo: Deployable Space Systems, Inc.
ROSA – the Roll Out Solar Array – is a technology demonstration of a promising solar array system for future spacecraft that relies on advanced structures enabling high-power solar arrays that are stronger, lighter and more compact than the current state of technology. 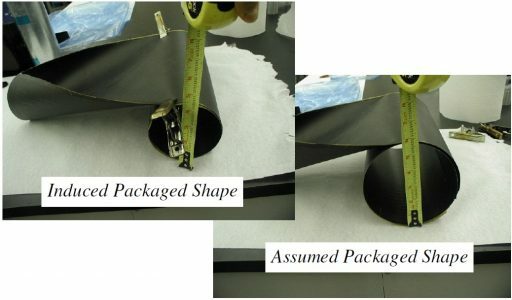 This type of flexible solar array is critical for the ever-increasing energy needs of satellite missions as well as deep space exploration ambitions that will rely on solar power at greater distances to the sun. 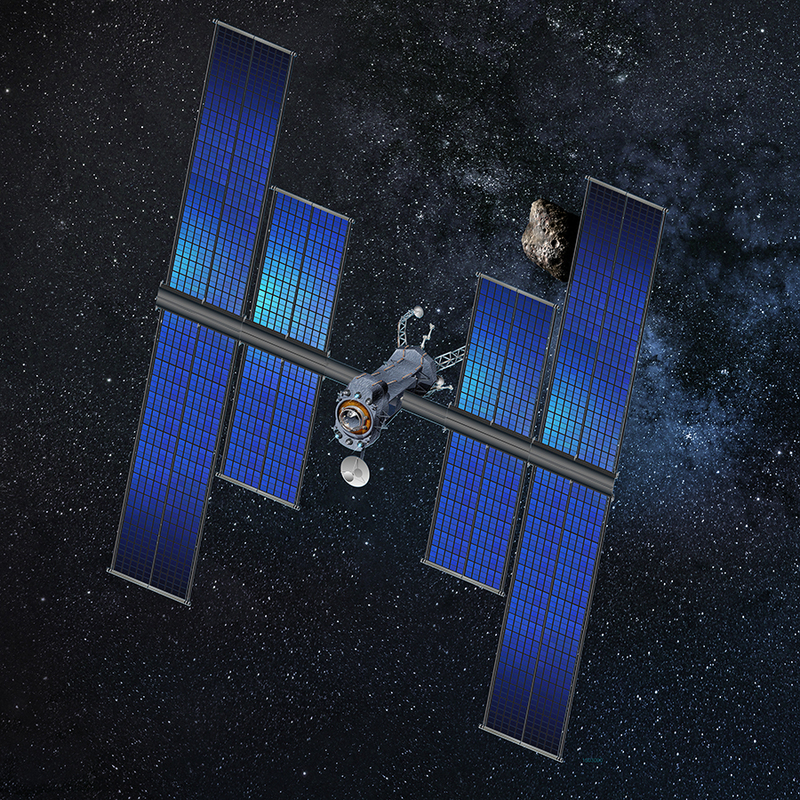 At present, the vast majority of satellites use large, rigid solar panels that must be stowed against the satellite’s body for launch and deploy once the satellite arrives in orbit. Additional mass is added by systems that enable solar array wings to rotate to follow the position of the sun to maximize power generation. ROSA is a new type of solar panel that rolls open in space and is more compact that rigid solar panels. The technology will also enable for easy retraction, making it particular useful for craft that return to Earth or require arrays to be retracted during propulsive mission phases. Roll-out solar array technology will also permit very large arrays to be delivered to space for power-generation at larger distances to the sun. 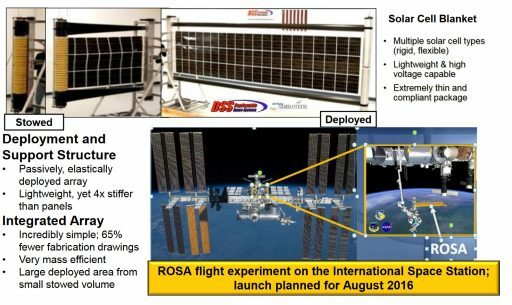 The ROSA investigation will study the dynamics of roll-out solar array deployment, retraction and shape changes occurring as a function of temperature to assess the array’s strength and durability in the actual operational environment to retire technical risks for future missions relying on this technology. ROSA is a project of the NASA Space Technology Mission Directorate that worked with Deployable Space Systems (DSS) and Space Systems Loral (SS/L), both based in California, to develop the prototype. 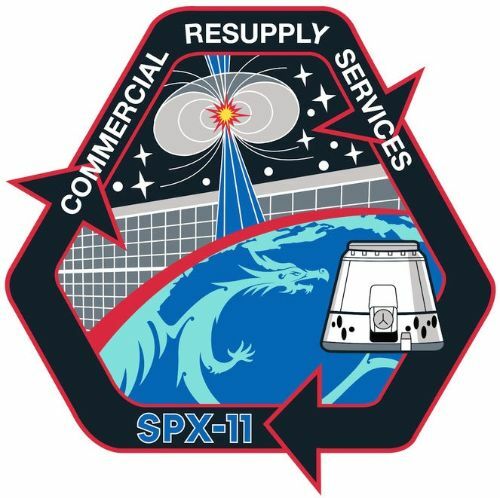 The U.S. Air Force is providing funding for the ROSA test flight aboard the Dragon SpX-11 mission. The Air Force is pursuing a similar Roll Out and Passively Deployed Array (RAPDAR) design because of its excellent power density – a critical requirement for many future Air Force missions. Heritage systems are limited to around 20kW of total power, at roughly 50W/kg; RAPDAR will realize a 250W/kg-class solar array system with a total output in excess of 50kW. 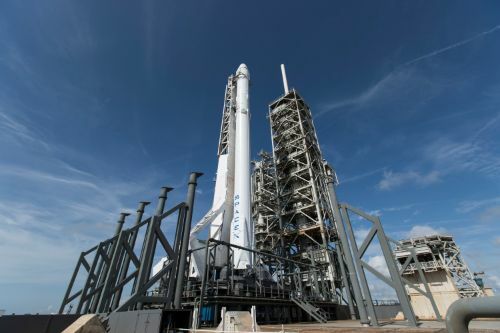 A linear trend since the early days of the space program shows power requirements for satellites double every four years and conventional rigid solar panel technology can sustain this trend only for so long. The RAPDAR design is scalable to between 1 and 50 Kilowatts and relies on innovative technologies such as Elastic Memory Composites (EMCs) and Thin Film Photovoltaic Cells. The array comprises a pair of slit-tube EMC longerons that form the primary load-carrying structure once unfolded. In the stowed configuration, the longerons are flattened and, when deployment is commanded, they automatically regain their original cross-section – no motor is required for deployment that occurs solely from stored energy within the longerons. The two primary longerons are connected by a series of battens, forming a central panel to which solar cells are attached. Wing panels on the outside of the two longerons open as part of the deployment to increase the surface area of the array. 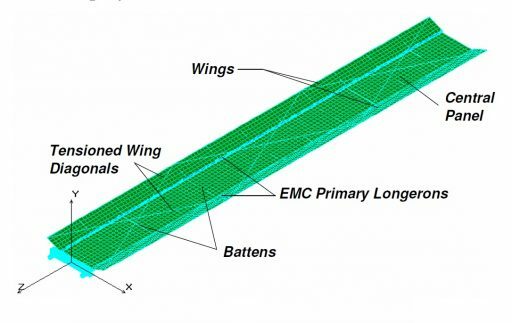 The wings are attached to the longerons by tensioned diagonals running from one tip of the wing to the other, holding the wings at a slight angle to the central panel. Stiffness, strength and dimensional stability of the system is provided solely by the two longerons. Deployment of the RAPDAR design is completed passively, making use of the solar-thermal environment to reach laminate temperatures that exceed the material’s glass temperature and cause the longerons to take their original shape by releasing stored energy. ROSA uses a different design that does not require a solar thermal deployment and instead uses only the stored energy in the composite booms that automatically roll out once released. 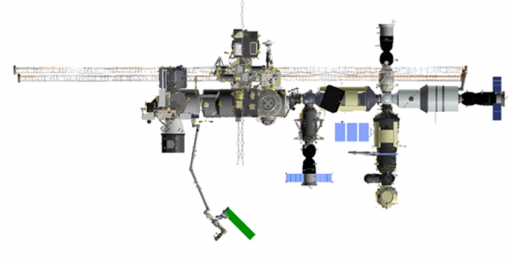 No motor is required for the deployment, but the ROSA technology demo makes use of an additional motor is part of the payload to accomplish the retraction of the array for its removal from ISS when the mission is complete. The ROSA flight experiment has the overall goal of characterizing the roll-out solar array design in a relevant combined space environment to compare model predictions and ground test data. Specific items of focus are the characterization of deployment loads and kinematics, deployed structural dynamics, temperature-dependent dynamics, blanket survivability and photovoltaic performance after the rigors of launch & deployment, and finally retraction loads and kinematics. 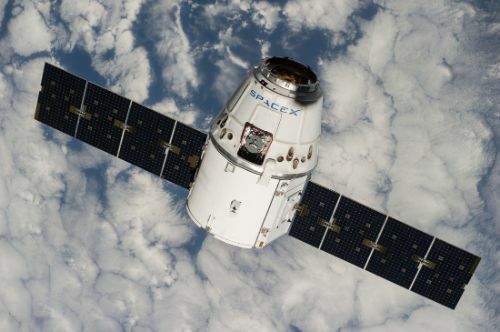 Riding aboard the Dragon Trunk Section, ROSA will be extracted by the Space Station’s Canadarm2 or Dextre robot and take up temporary residence on Express Logistics Carrier 1. Once ready for the experiment, ROSA will be picked up by the robotic arm and moved into the experiment position below ISS, receiving power and data connectivity through the robotics system. Deployment occurs on ground command by releasing the two rolled-up booms and a series of sensors and cameras will be used to measure the deployment torque, deployment kinematics, velocities and accelerations while the longerons unwind. Structural dynamics and changes in full-sun and full-shadow are measured as well as frequency and mode shape for the system bending mode and blanket drum mode. Over the course of the week-long mission, the current/voltage output of the array will be tracked to assess the operational performance of the array. I-V sweeps will be conducted from near-open circuit voltage to near-short circuit current with auxiliary measurements of temperature, sun angle and shadowing. A sinusoidal actuation at the array root with a motor will be used for frequency dynamic assessments. At the end of the test, a different motor will be used to retract the array during a full-insolation phase and ROSA will be placed into the Dragon Trunk again to be disposed of via destructive re-entry.